Full Redundancy POS operations between POS terminals & Locations upon Network failures to achieve ZERO-LOSS in POS operations time. Customer Display (Second Display) for Ad management and lots more. 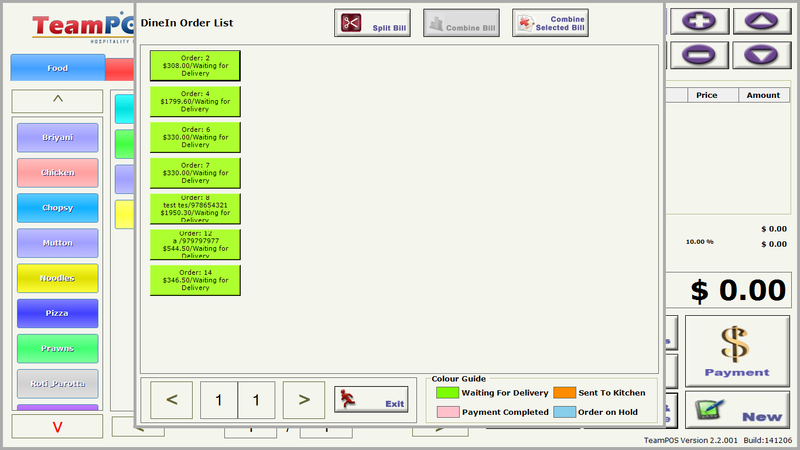 Apart from standard features like, logout after each sale, add multiple modifiers to an item, split and merge bills, kitchen display system, customer display, void check, discount, order tracking, opening stock, etc.,. 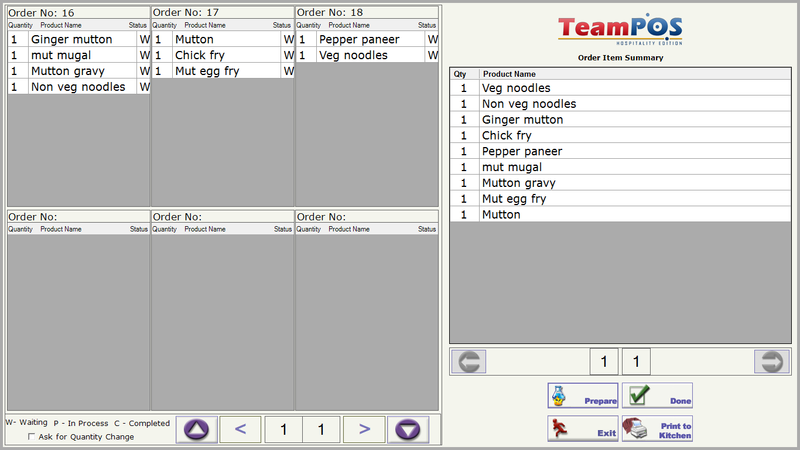 TeamPOS comes with a build-in "Kitchen Display System" module. It a simple yet very important application that runs in the kitchen. A "Kitchen Display System" enables the Chef to manage the kitchen very efficiently. With the help of the "Kitchen Display System", the Chef can now track status of the orders placed by the guests/tables on a real-time basis. 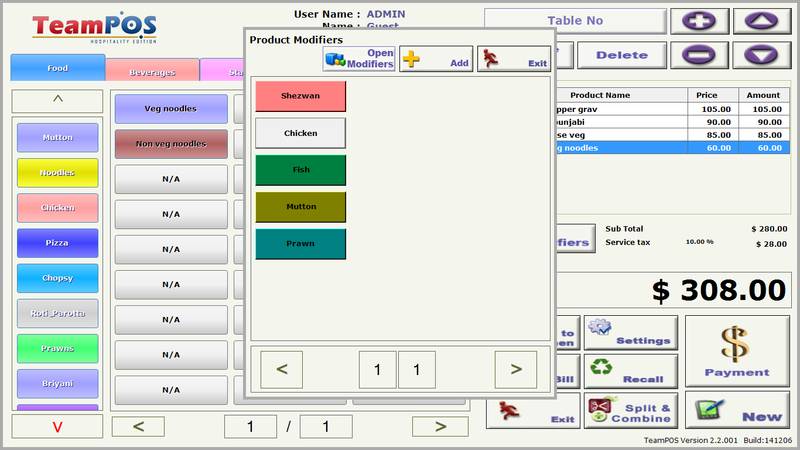 This unique built-in module helps the Chef to view all the orders in pipeline and offers him a flexibility to pick and choose the items he wishes to prepare together. This reduced the preparation time, ensures optimum utilization of resources and deliver enhanced experience to the guests by reducing their waiting time. 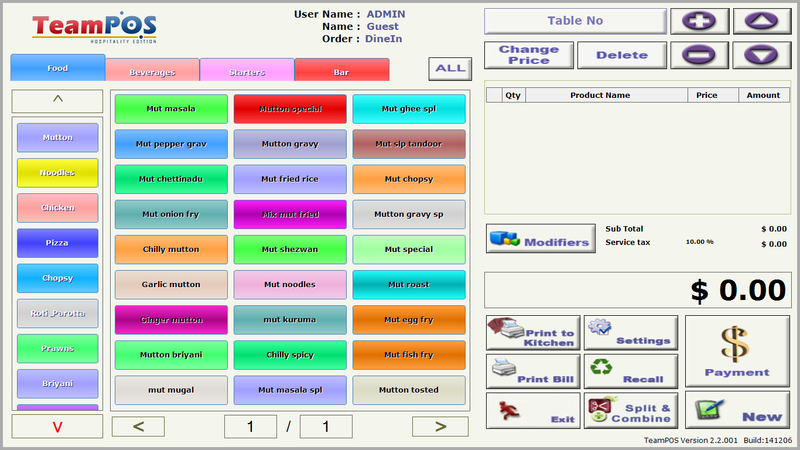 A "Kitchen Display System" can be mapped to a dedicated Kitchen Printer or a Digital Display to view the status of each order symultaneously. TeamPOS also comes with various preloaded reports which give you a 360 degree insight on the business. This intelligent reporting system is extremely important for making short term business decisions and also to determine the growth strategy. TeamPOS Cloud reporting module gives it a major facelift compared to its competing products in the market. This module enables you to view various reports and export the reports in Excel format from anywhere, anytime. With Cloud reporting module you can monitor your business happening across geographies remotely with just a few clicks. The Reporting module facilitates data analytics initiatives to business data, to describe, forecast, and improve business performance. The data analytics service will help you perform predictive analytics, enterprise decision management, retail analytics, store assortment and stock-keeping unit optimization, marketing optimization and marketing mix modelling, sales force sizing and optimization, price and promotion modelling, predictive science, credit risk analysis, and fraud analytics. Therefore, Cloud Reporting clubbed with Data Analytics has the potential to grow your business to the next level in a short span.